I have written some poems based on different crimes and reasons for them. They are all different types of poems. Known for crimes in the past. Infamous for all you have done. Fearing what the police has in store for you. Escaping to a new life after a bad past. Careless to carry a knife around. Revenge on people in the past. Incredibly mad at other people. Mad at other peoples actions. Eager to see the end of someone. I tried to make this poem show that there is often a reason for the actions of criminals. They have reasons for their actions, and I think most of this may be because they are angry. I tried to make this symbolise that criminals are humans and all the reasons they are doing this come down to one thing. Yes, no fun for anyone. 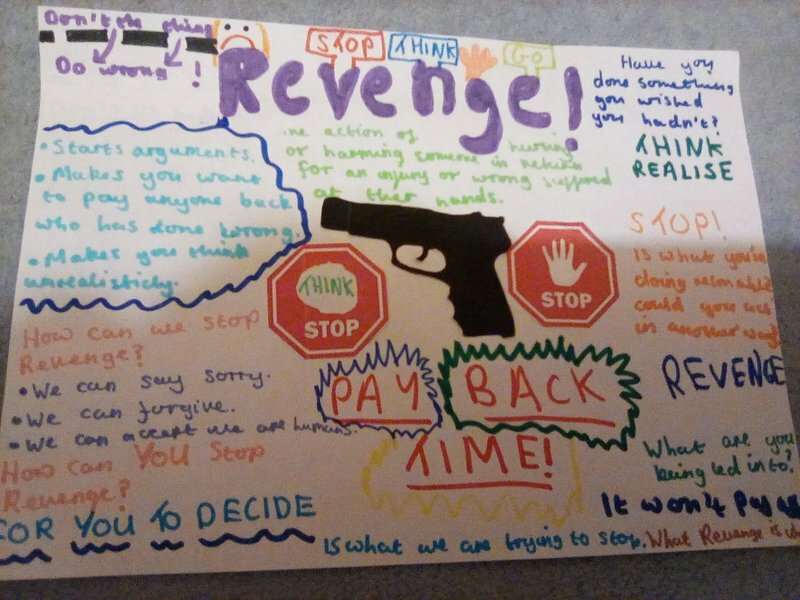 This is my poster on Revenge. Thanks for your poems and this creative piece of artwork! You'll actually be asked to create a poem as your Final piece for this Issue! So, for now, keep these ideas and this inspiration on the back burner while you father facts, reasons, opinions and evidence about the Issue. Then, your creativity will pay off in sessions 5 and 6! Thanks! I am looking forwards to then. Thanks! My device started playing up and it took a LONG TIME. Have you done any posts on a similar subject? I'm looking at lots if other people's posts... Thanks again! I love your poems - especially that they are acrostic; I was in a book about acrostic poems...! - and well done on the poster! Fabulous!